Christmas is coming and these easy to make marshmallow Krispie Chirstmas Trees are bound to bring a smile to your guests faces. Infact they are so simple to make that you could get the children decoration them. These aren't as sweet as the Rice Krispie Mallow bars that you cab buy in the shops, but with the addition of some chocolate decorations I don't think they need to be any sweeter. I melted my marshmallows and butter in a saucepan, but I guess that it would work just as well in the microwave, you would just need to stop it every 10s or so to give it a stir. I had originally had the idea of making them into lollipops. However, my laziness got in the way and I couldn't be bothered to drive to the next town to purchase lollipop sticks. I was having a browse in Sainsbury's, however, and these mini Reese's cups are perfect. Depending on how you want to display them, you can decorate one or both sides. It is slightly easier if you display them lying down as you need a really flat surface otherwise. Melt the butter in a pan along with the marshmallows. Mix in the rice krispies and a few drops of food colouring. Line an 8inch spring form cake tin with grease proof paper. Use a little butter on the sides. Pour in the marshmallow mixture and press down. You will find it easier doing with your hand than a spoon. Allow to cool and then cut into triangles. Melt a small amount of chocolate and add it to a piping bag. 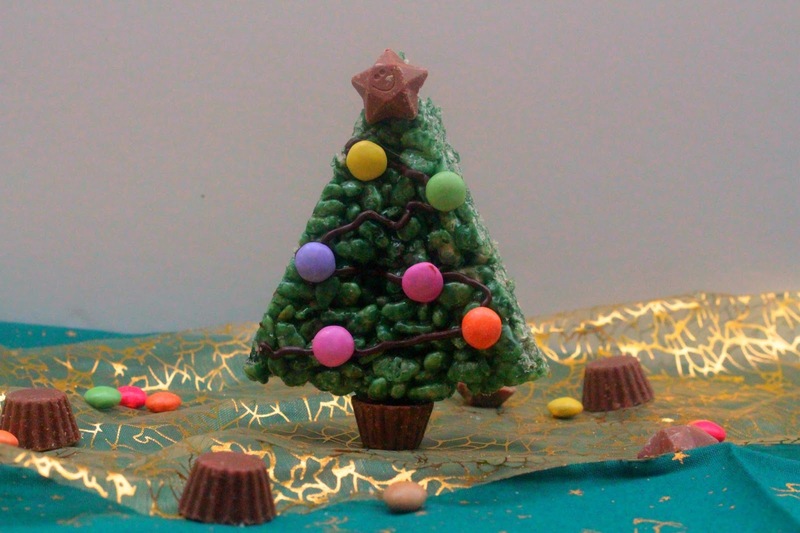 Use a small amount of chocolate to "glue" on the Reese's cup at the bottom of the tree and the Milky way star at the top. 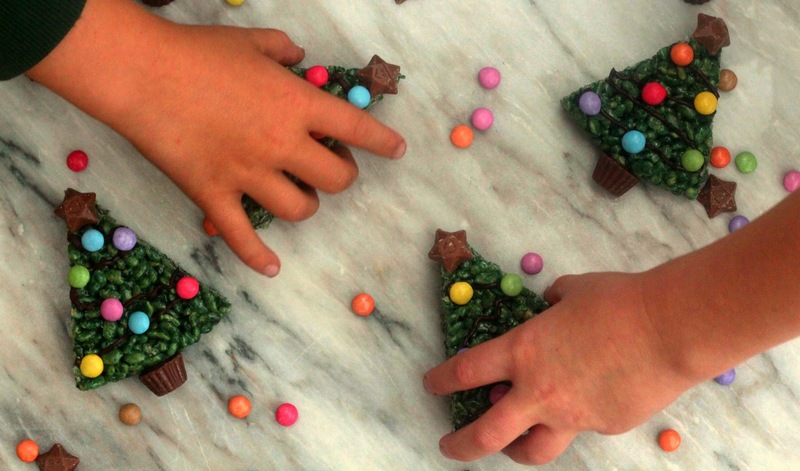 Then add a zig zag of chocolate from top to bottom and add mini smarties on this. 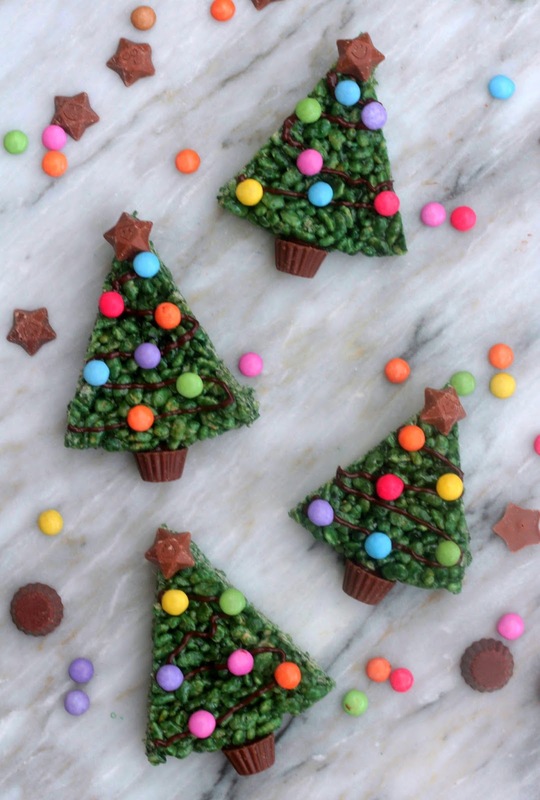 These are brilliant Louise, I just love the small reece's Cup that you used in place of the lolly sticks. Brilliant!